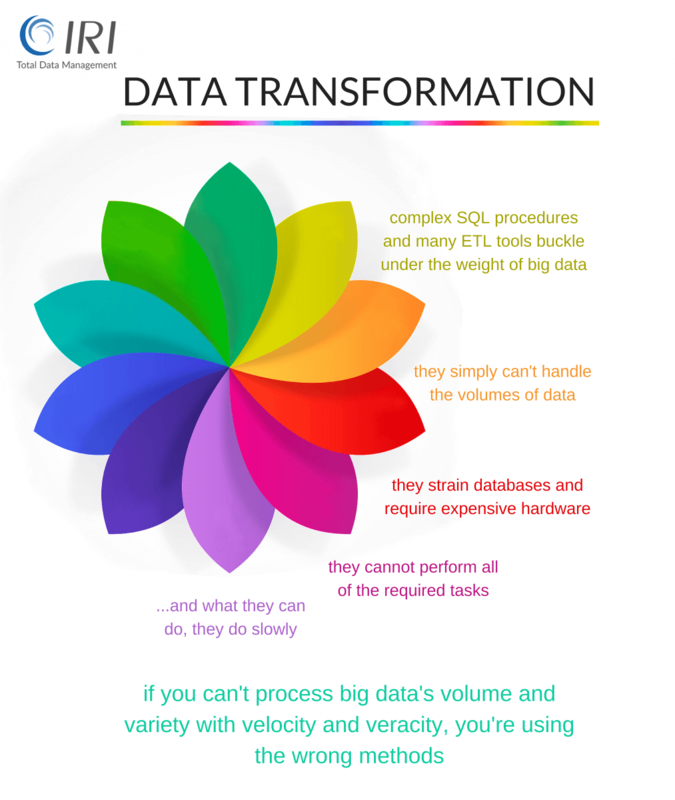 How do you transform data today? Transform huge data volumes without using your DB, or changing your IT fabric; e.g., without Hadoop, NoSQL, or an ELT appliance? Leverage multiple CPUs and cores for big jobs, run several tasks in the same I/O, and dynamically allocate resources to optimize performance? Easily understand, share, and modify your data and job definitions without a major learning curve? 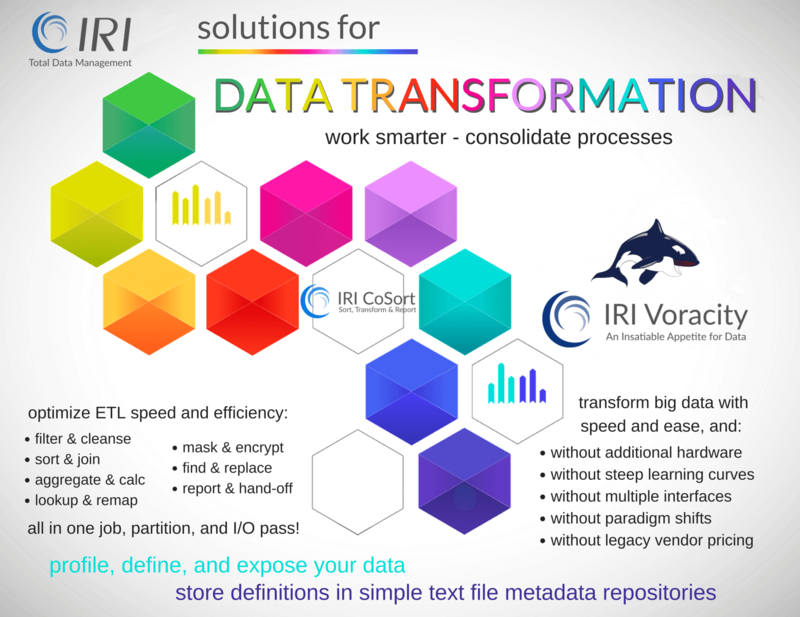 The SortCL program inside both the IRI CoSort package and IRI Voracity platform is a long-proven (and now Eclipse-supported) 4GL that does the heavy lifting of data transformation in the world's largest data warehouses, operational data stores, core banking applications, clickstream data webhouses, and more. Voracity users can also run the same transformations defined in SortCL jobs seamlessly in Hadoop MapReduce, Spark, Spark Stream, Storm, and Tez from the IRI Workbench GUI. Optimize ETL operations as you combine sorts, joins, and aggregates in a single job script, partition, and I/O pass. At the same time, de-duplicate and filter, convert and re-map, lookup, rank, (de-)normalize, calculate, shift, encrypt to protect, and mask to re-cast. Create custom reports, and hand off pre-processed subsets to the files, tables, and federated views that your applications, data marts and BI users can leverage immediately. SortCL and related facilities in the CoSort package accept many third-party data layouts, e.g., DB DDL, COBOL copybooks, CSV, LDIF and XML files, CLF and ELF web logs, and SQL*Loader Control File metadata. SortCL job scripts contain SQL-familiar commands that use and/or reference the layouts. Its GUI discovers and generates those layouts automatically. SortCL transformations work hand-in-hand with data extraction and loading utilities. SortCL can take piped data from IRI FACT (Fast Extract), and pipe it pre-sorted into database load utilities like SQL*Loader. SortCL can also connect through ODBC to other databases and Excel to acquire and deliver data. SortCL transforms can run alongside ETL tools like Informatica and DataStage, to optimize their performance. SortCL jobs run on the command line, in batch scripts, from 3GL programs, via API calls, or in the IRI Workbench GUI, built on Eclipse™. Easily embed these transforms to accelerate your applications. SortCL exploits CoSort's granular speed tuning and flexible CPU licensing. IRI's continuing innovation in parallel data movement, I/O and memory management, data manipulation functionality and consolidation -- along with our meaningful industry partnerships -- keep you at the leading edge of big data transformation.